This year more than ever, there is a Primavera Bits for everyone. 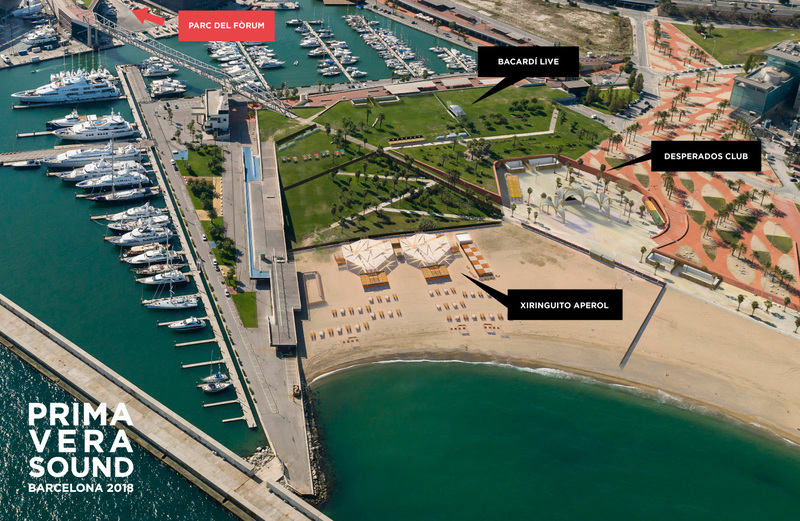 This electronic music space inside Primavera Sound inaugurated in 2016 continues to expand and creates an additional third stage, the Xiringuito Aperol on which the festival will kick off on each of the three main days in the Parc del Fòrum. The music will literally reach the beach for the first time thanks to this area, in which as well as dancing to the sessions by heavyweights such as Four Tet, Daphni and Floating Points, festivalgoers will be able to have a swim and taste the popular paellas of the Kauai restaurant of Gavà. Four Tet, Floating Points and the Dekmantel festival will be the ambassadors of this new stage, on the sands of the Fòrum beach that will open its doors at midday and offer six hours of music to warm up at the water’s edge. On Thursday 31st May the British artist Four Tet will transport the London electronic scene to the Mediterranean with the DJs Josey Rebelle and Champion and he himself will close the afternoon session with Daphni, the alter ego of the versatile Dan Snaith (Caribou). Friday will have only one protagonist: Floating Points with a marathon six-hour DJ set that promises to be out of this world. And on Saturday 2nd June, the Xiringuito Aperol will be curated by the Dutch festival Dekmantel, that as well as overseeing the decks will present Orpheu The Wizard, Palmbomen II and Palms Trax to start winding down the 2018 edition from midday onwards. When evening falls the programme will move to the two main stages of Primavera Bits. From 6pm from Thursday to Saturday, the open air Bacardí Live stage will host some of the live acts that will mark the 2018 edition of the festival. Some of them featuring the presentation of new albums from Jon Hopkins, Floating Points, Oneohtrix Point Never and James Holden & The Spirit Animals, Chromeo’s wild ecstasy, the exquisite proposals of Mount Kimbie and Panda Bear, bedroom R&B from Majid Jordan, the DJ set by a historical figure of hip hop and beastie boy Mike D, the experimental antics of Jlin and Madlib and a look to the future with stars in the making like Jorja Smith and the ultra energetic Superorganism. It will be the confirmation, on stage, that electronic music has permanently permeated pop, psychedelia and R&B. 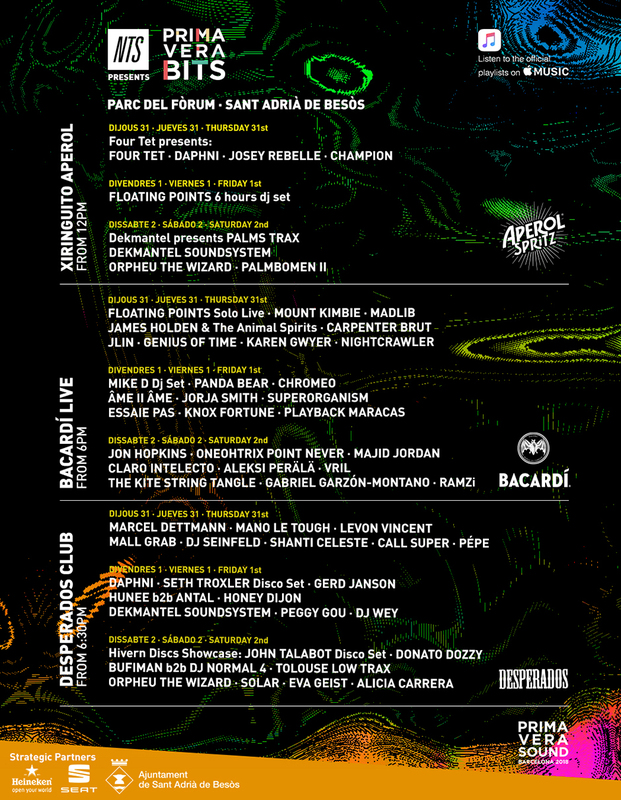 From 6.30pm each day and until sunrise, the Desperados Club stage will turn Primavera Bits into a huge club that will offer sessions for lovers of undeniable electronic sounds. The main players will be the usual suspects when putting together endless nights of techno and house, such as Mano Le Tough, Honey Dijon, Marcel Dettman, Peggy Gou, Gerd Janson and the Hivern Discs posse (in charge of programming this stage all day Saturday), not to mention the Italian Master DJ Donato Dozzy, the back-to-backs by Hunee and Antal and Disco Sets by Seth Troxler and local hero John Talabot. As always, electronic music will not be confined exclusively to Primavera Bits, but will reach every corner and stage of Primavera Sound. This will make it possible to experience Nils Frahm’s dreamy experimentation, the hypnotic live performance of Four Tet presenting his new album, sets by contemporary legends such as The Black Madonna and DJ Koze, invitations to dance from Lindstrøm, Ross From Friends and DJ Python, live acts by THE BLAZE and Delorean all around the Parc del Fòrum: each member of the audience will be able live their own adventure. The countdown has begun! The Primavera Bits programme is included in Primavera Sound 2018. Full festival tickets are still available, as are tickets for Thursday and Friday. Saturday tickets are sold out.